I'm excited to have another opportunity to review a book for TLC Book Tours. 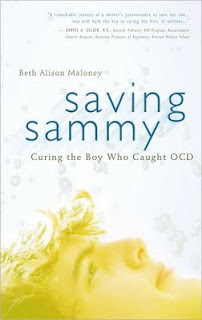 This time the book I am reviewing is Saving Sammy: Curing the Boy Who Caught OCD by Beth Maloney. Honestly, I kind of ignored the book for a while after TLC sent it to me, simply because I thought it would be fairly heavy subject matter (being a true story about an ailing child and all) and I wasn't really in the mood for that kind of a read at the moment. Imagine my surprise when I finally did pick up the book to start reading and found that I could not put it down. Beth Maloney is a seriously talented writer and the book read more like a novel than the play-by-play of how you can also help your child in such a horrible situation that I assumed it would be. Her story is riveting, and she brought me right in. I found myself feeling her anguish as a mother as she watched her son deal with the horrible compulsions brought on by OCD. I found myself feeling relief when they finally started to get promising information, disappointment when hopeful cures did not work, and absolute joy when Sammy finally began to get better. Not only does this book serve to educate about how Strep can be a very real cause for Obsessive Compulsive Disorder, but I came away wanting to be a better advocate for my children. Beth's experience taught me that I should never take a doctor's answers at face value. Especially if I knew in my heart that more could be done. A parent's job is to exhaust every avenue until you know that your child has received the absolute best care possible. Obviously, I haven't had a situation that is quite as dire as what Beth Maloney faced with Sammy, but I can think of a few times where I have had to be a little forceful with doctors. There is the time that Bria had pneumonia, only the pediatrician swore that it was just a virus or something and did nothing. I took her into that office two days in a row, paid a lot of money in co-pays, only to be told it wasn't anything to worry about. Finally, I took her into the ER, where she was properly diagnosed with pneumonia by the doctor there. It was a hard decision for me, because I don't like to overreact about things, but I am so happy I refused to take my pediatrician's word for it, and got my daughter the care she needed. Then there was the time that Chloe had 6 ear infections back-to-back. They would go away for a few days while she was on antibiotics, but return as soon as we finished the series. We tried several different types of antibiotic with the same poor result. The pediatrician I had then (different one from Bria's pneumonia incident) didn't think she needed tubes and just wanted to keep trying antibiotics. The poor baby (13 months old) had such a horrible yeast rash by this time that I was ready to never give her another antibiotic again. I had to push hard to get a referral to an ENT, where she was immediately slated to get tubes put in and hasn't had an ear infection since. But those experiences are nothing compared to what Beth Maloney did for her child. When her doctors wouldn't look beyond face value, or listen to the research she had uncovered, she fired them. She combed the country and was willing to travel far distances in order to get Sammy the help that he so badly needed. After several frustrating experiences with medical and mental health professionals, she finally found a savior in Dr. Catherine Nicolaides, who had treated several children with OCD successfully with antibiotics. Because apparently, there are a number of children who develop OCD due to Strep. Most of the medical field that Beth dealt with seemed to discount this research, or ignore it entirely, to her great frustration. But after finding Dr. Nicolaides, she found hope, and eventually a cure, for Sammy. And she continues to be an advocate. Not only did she write this book to educate others, but she has helped many people get to the bottom of their own children's problems as well. She helped a friend whose son had been diagnosed with autism find out that his autistic tendencies were actually due to Lyme disease. There is research out there that supports this, and yet nobody asked those questions at first. Be an advocate for your children. Ask the tough questions. Do your research. That's what I learned from this book. It really isn't about OCD at all. It's about being a real parent. We as parents do need to realize that we are the PARENTS. We know when something isn't right, and we know when something doesn't work. I must say that in recent years I have noticed an increase in laws and hospital policies to take the power of information out of the patients hands, and that is truly unfortunate in those cases where it exists. It is even more sad when you realize that they are doing this because doctors images as Gods have been removed, and more and more parents/patients are taking back power over their health by becoming more educated. This means a more difficult time for doctors, and at times lost clients. Something the medical profession hasn't experienced since its inseption. Great review and good lesson for all parents. Thanks for sharing, Lara. I'm also the type that doesn't like to push but when it comes to my kids, I turn into a real jerk-face. I push. I prod. I bug people. My dudes mean everything to me and for all the things I don't have courage for--I have enough for them. We have an old family friend who developed OCD behaviors which later led to devestating problems in his family and marriage. We need to be advocates for our children. Who else will be?? Wow. It's all about being a real parent. Something I so need to work on. Being there. In the minute. For all of the minutes. Thanks for sharing your review, your insights, and your personal experiences. Great review... thanks for sharing. there is a powerful lesson there for sure. Very interesting. This sounds like a facinating book! That's awesome. Thanks for sharing that. It not only makes me feel even stronger about being an advocate for my son but even for myself because I find we all can be brushed off. Lara, this is really a wonderful review. I agree that we as parents really do need to be advocates for our kids. Your experience with Chloe and her ear infections is something I went through with my youngest. We were in the drs. office so much, it was ridiculous. I became almost apologetic with the doctor until my friend said, Why isn't he suggesting tubes? Or having the adenoids removed? Made me think they weren't really taking care of us properly and empowered me to stand up to the doctor. Thank you so much for taking the time to read the book and share it with your readers. Awesome review--makes me want to go get it now! Also, I LOVE--ADORE--your new header!! Sounds like a MUST-READ ... just checked my library and they don't have it ... yet ... I'll be sending in this suggestion. I have also had experiences where mother's intuition won over a doctor's diagnosis. I am grateful we have doctors, mind you, but I am also very grateful for the whisperings we receive as mothers to help our children. Looks great - thanks for sharing! And love your new header!!! Sounds fascinating--and a must-read for any mother bear. Ooooh, this does sound like a good book! I enjoyed your review. And darn, how awful to have 6 ear aches in a row. Sick kids always makes a moms heart heavy. It took me a ridiculously long time to become an advocate for my kids. I'm a rule keeper, and authority's authority, right? But I finally did learn to trust my instincts, get my facts, and push, fire, complain - whatever it took. I hated the thought of being the squeaky wheel, but I learned you don't always have a choice. The book sounds fabulous. I wish the author and her son all the best. Sadly because of the controversy over diagnosis and treatment, due to the discredited IDSA Guidelines which are currently under review, thousands of people are struggling for diagnosis and treatment of Lyme Disease. Another excellent read is Pam Weintraube's book Cure Unknown, whether you have lyme or not it is quite likely you know someone with Chronic ill health that has not properly been assessed to see if Lyme is part of the problem. Have a look at the links on my side bar which take you into many interesting research articles. I had strep about 14 times when I was a Sophmore in high school. I agree with being the only advocate for our kids. I feel sorry for the kids whose parents don't advocate for them (at all) at school. They get left out.